The enamelled insects are exquisite, high quality enamelling almost as though they were painted in a reference book, and I've not found anything of the quality to match them. The snakes have smiles and are gilded. Applied blue top/rim onto the clear with drip trails all the way round. The whole piece is enamelled all over. Polished pontil mark on the base and firepolished rim which has been gilded. The handle has a gilded pattern on it. I suspect it is probably Harrach? any thoughts much appreciated as always. Not normally my kind of thing, but I must say, I do love the insects. Fabulous find, m! I've put another close up of one of the winged insects / bugs on, and one of the flowers, as well as the gilding on the bottom part of the handle. The enamelling is quite flat, not raised over yellow underbase or anything. I suppose it could have been made by Harrach and enamelled either there or elsewhere. There is a smaller Harrach vase on Mike's site here that has snakes with a similar loop in and the blobs on the ends of their tails which I why I thought it must be Harrach. I don't suppose there is any possibility it might French? On one of my searches I think I recall reading that Mike had said something about the Bohemian enamellers being more varied in their content of insects...or something similar to that. Will try and find it again. six legs only,it's showing through underneath the body but is the bottom part of the leg from the other side. I checked for discrepancies They've been painted by an artist - there may be artistic license on their colours and designs but as far as I can see, they are all insects lol. 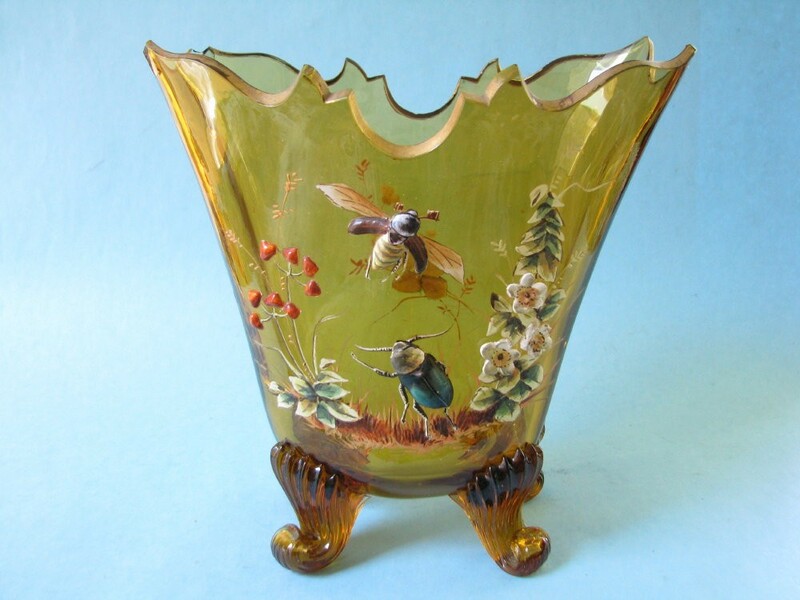 most of the 'insect'pieces I can find have insects that are painted like this (see link below), or they are in this style, sort of gilded outline or some kind of outline and then infilled with a single colour or simple colours. They aren't done to the complexity the jug is. I wonder if it was made by Harrach and enamelled by Moser? and on this one here on the last picture the buds have marked similarities with the buds on my jug - again I cannot find reference for the attribution and it doesn't appear to be signed. Page created in 1.274 seconds with 27 queries.